Introduced to the public in late 1927 as a “New Ford Car,” the Ford Model A could trace its roots all the way back to the establishment of the Ford Motor Company in 1903. Actually, the first car produced by the developing auto manufacturer was labeled the Model A. Henry Ford would work his way through a series of letter designations for his automotive creations before settling on the successful formula that would become the Model T. In the years that followed, as America’s roads and driveways filled with Model T’s, Henry Ford would remain reluctant to significantly tamper with his beloved car’s design. It was only in the face of plummeting sales by the mid 1920’s, the result of a buying public that sought the modern upgrades offered by Ford’s competitors, that Ford finally relented. In an unusual business move, Ford halted production of the Model T in May of 1927, shutting down the entire production operation for 6 months to allow for retooling and final development of the new Model A Ford. A Ford Mod. A Coupe being assembled. 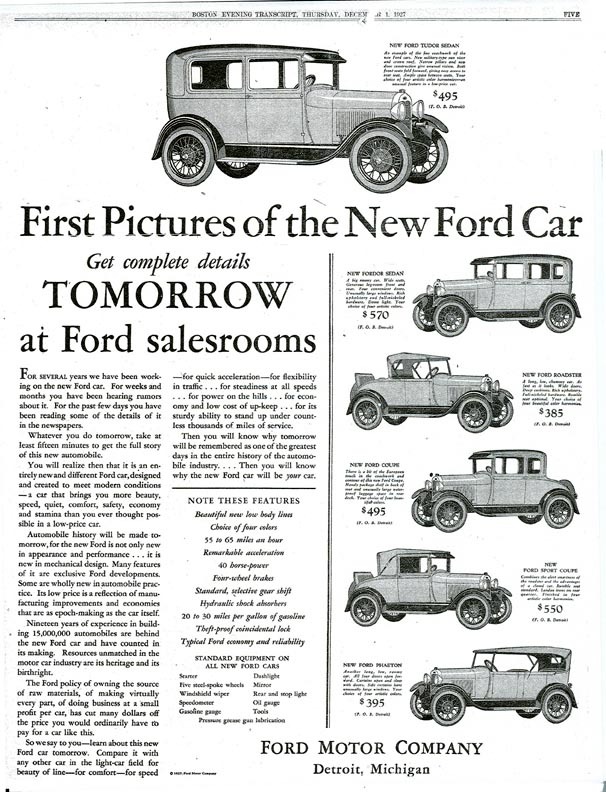 Working under an impossible deadline, Ford managed to get the design and production requirements in place for the release of the “New Ford Car” by November of 1927. 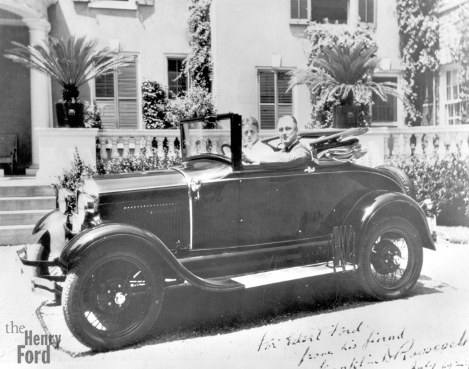 Henry’s son, Edsel Ford, had unsuccessfully tried to convince his father to abandon the Model T years earlier. 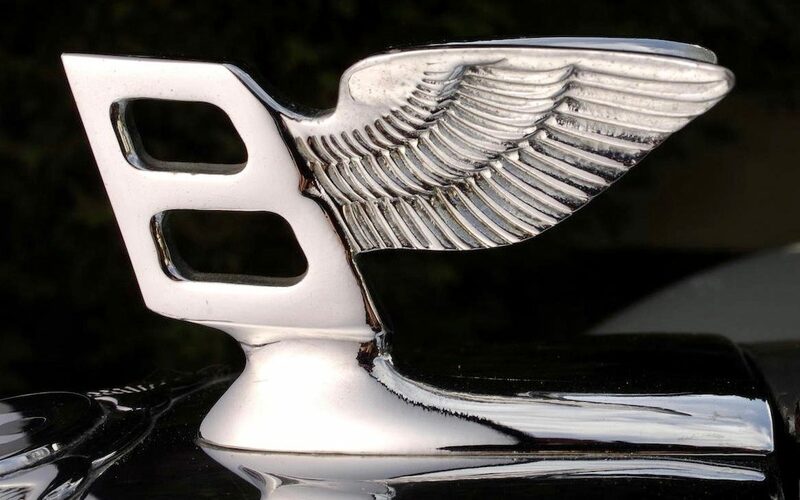 Unbeknown to his father, Edsel had been secretly working on the development of a new car and would ultimately play a significant role in the design of what would become the Ford Model A. 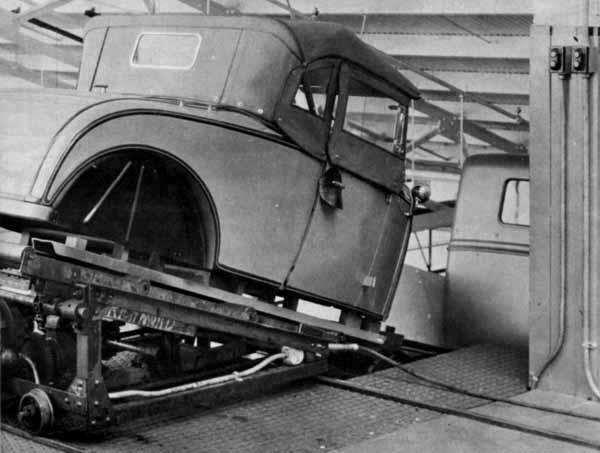 A Ford Model A Roadster body ready to be mounted on its chassis. Unlike its predecessor, the Model T, which was the result of an evolving process of design, the Model A was designed, complete, from the ground up. The Model A was truly a “New Ford Car.” Mechanical upgrades for the Model A Ford included a new 3-speed transmission, hydraulic shock absorbers, and four-wheel mechanical brakes. Other significant improvements were an electric starter, water pump, speedometer and gas gauge, and the introduction of Triplex safety glass. 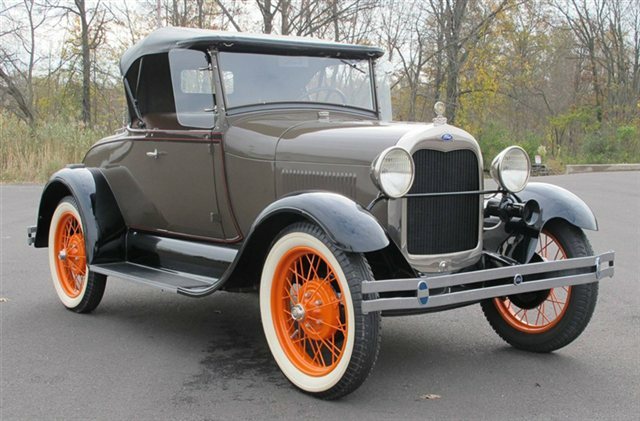 The styling of the Ford Model A, elegant and integrated compared to the Model T, brought Ford into the modern era with a vehicle that looked more like a car and less like a horseless carriage. 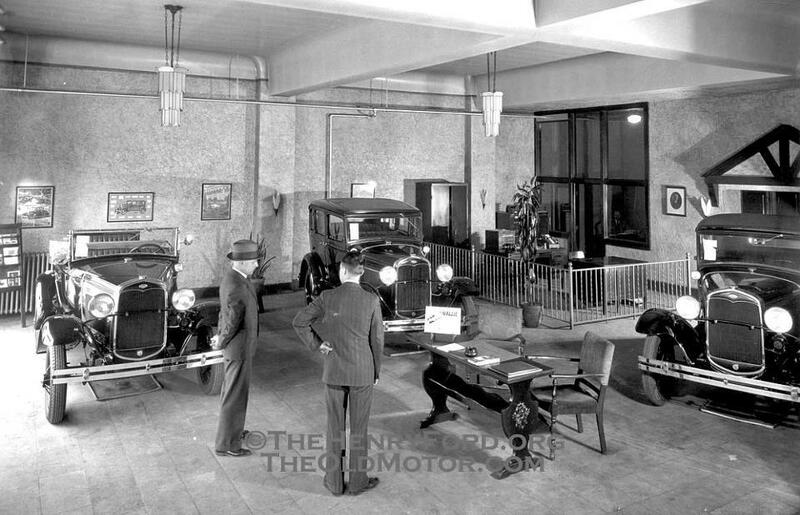 A period Ford Salesroom featuring Ford Model A’s. The first Mod. A was delivered on Jan. 26, 1928. 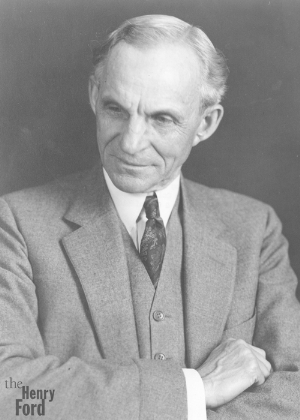 Henry Ford created a sense of hype and mystery surrounding the release of the Model A Ford, relying on the media to reach the buying public and generate interest in the “New Ford Car.” Shortly after the Ford Model A was made available to the public on December 2, 1927, orders for the new car far exceeded supply. Ford scrambled to increase production and by mid 1928, producing up to 4,000 cars per day, was still not meeting the buying publics demand. 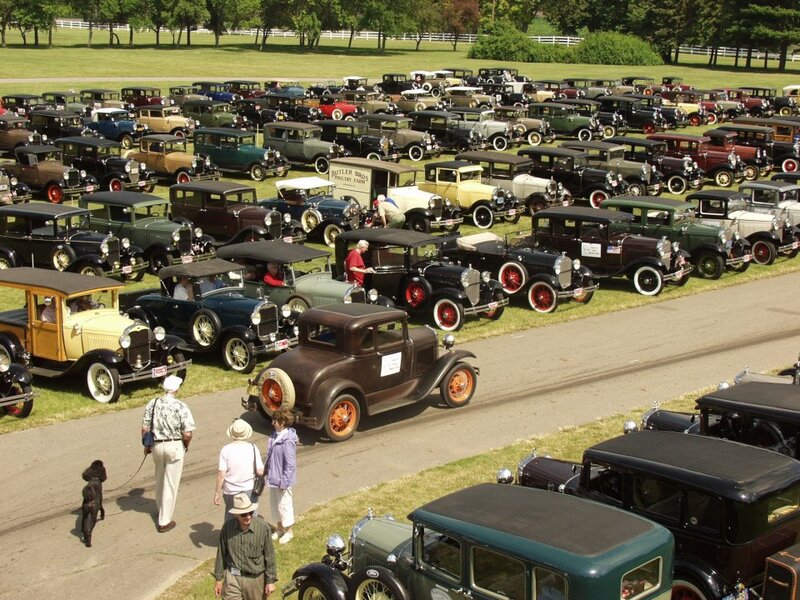 In an effort to meet demand, Ford steadily boosted production, peaking at around 9,200 cars per day by June of 1930. Standard Phaeton, Standard Roadster, Standard Coupe, Special Coupe, Sport Coupe, Business Coupe, Tudor Sedan, Town Car, and Leatherback Fordor Sedan. Truck bodies included: Open Cab Pickup, Closed Cab Pickup, Pickup (box), “A” Panel Delivery, “AA” Panel Delivery, and Deluxe Delivery. In 1929, Ford expanded the options for passenger car body styles by adding the Steelback Fordor, Cabriolet, Station Wagon, both Murray and Briggs versions of the Town Sedan, as well as Murray and Briggs versions of the Standard Fordor. The Standard Fordor (2 window) was also introduced. Options for truck bodies remained the same from the previous year. For 1930, the Leatherback and Steelback Fordors, as well as the Special and Business Coupes, would be dropped from the lineup. New passenger car bodies included the Deluxe Phaeton, Deluxe Roadster, Deluxe Coupe, Deluxe Fordor (2 window) and Victoria. Truck body options included the addition of the Deluxe Delivery and Panel Delivery (drop floor), Special Delivery, Town Car Delivery, “AA” Panel Delivery and the “AA” Deluxe Delivery. 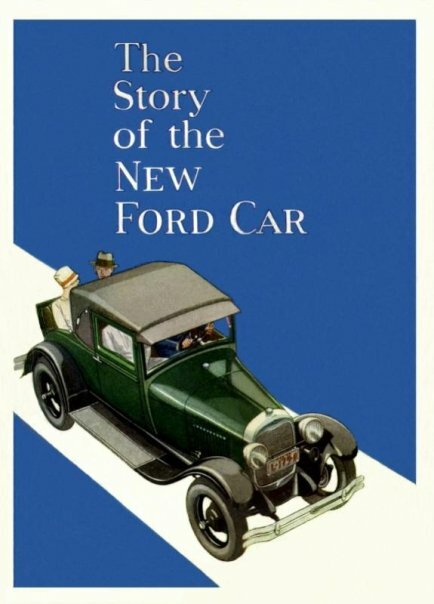 The Story of the New Ford Car poster. The year 1931, was the final of Ford Model A production, would mark the most extensive offering of passenger car and truck body styles in the vehicle’s brief history. 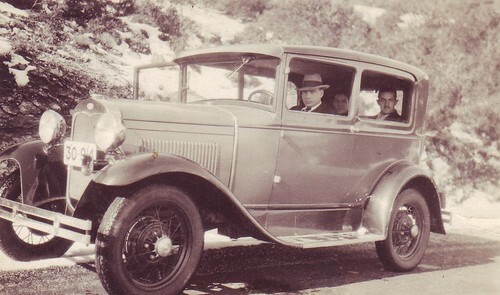 New passenger cars for 1931 were the Deluxe Tudor, Slant Window Cabriolet, Slant Window Standard Fordor, Slant Window Town Sedan, Slant Window Deluxe Fordor (Blindback) and Convertible Sedan. The Standard Fordor (2 window) and Town Car were no longer offered. For truck bodies, a Deluxe Pickup and a wide bed Pickup (box) were introduced. 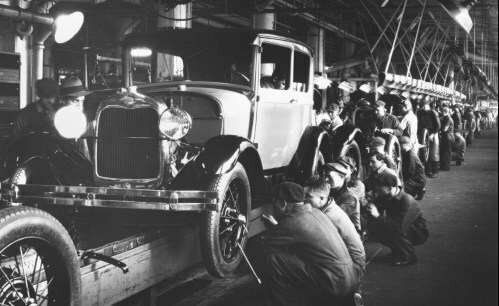 Like the rest of the nation, the Ford Motor Company would endure the effects of the economic Depression that began with the stock market crash in October of 1929. 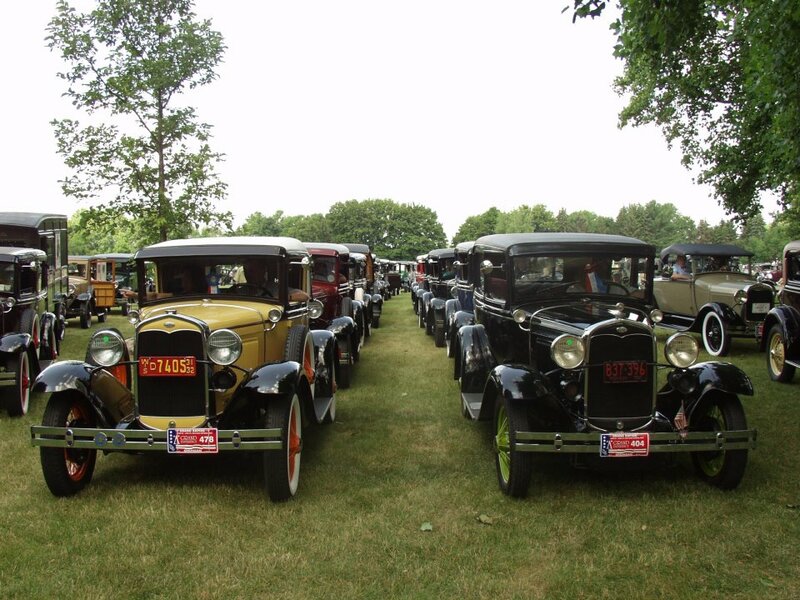 Despite reducing prices for 1931, Ford continued to see a steady decline of new car sales. 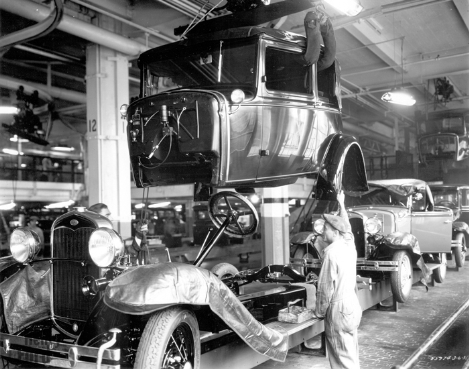 Perhaps learning from his mistake of sticking with the Model T long after the public regarded it as outdated, Henry Ford had been actively working on a new design for 1932. 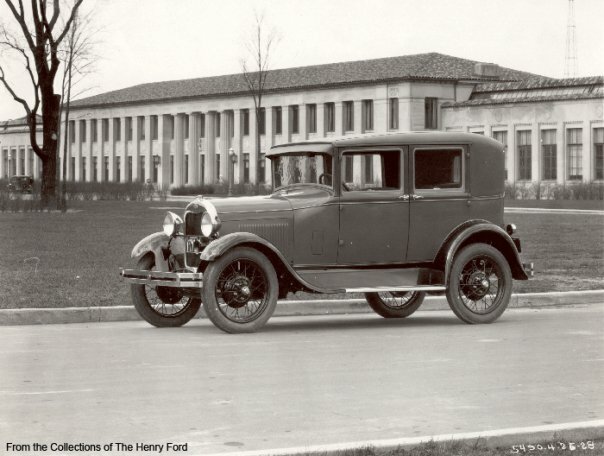 The successful development of the new V8 Ford for 1932 would ultimately put an end to the short but successful run for “Henry’s Lady,” the Model A Ford. A FMA Coupe in the snow! President Franklin D. Roosevelt (FDR) is sitting in a 1929 Model A Ford 68A Convertible Cabriolet. 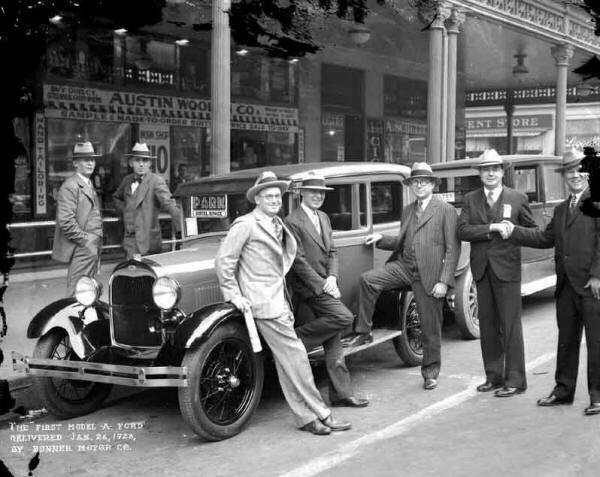 Summary of models produced: Ford Model A Standard Phaeton, Standard Roadster, Standard Coupe, Special Coupe, Sport Coupe, Business Coupe, Tudor Sedan, Town Car, Leatherback Fordor Sedan, Open Cab Pickup, Closed Cab Pickup, Pickup (box), “A” Panel Delivery, “AA” Panel Delivery, Deluxe Delivery, Steelback Fordor, Cabriolet, Station Wagon, both Murray and Briggs versions of the Town Sedan, as well as Murray and Briggs versions of the Standard Fordor, Standard Fordor (2 window), Deluxe Phaeton, Deluxe Roadster, Deluxe Coupe, Deluxe Fordor (2 window), Victoria, Panel Delivery (drop floor), Special Delivery, Town Car Delivery, “AA” Deluxe Delivery, Deluxe Tudor, Slant Window Cabriolet, Slant Window Standard Fordor, Slant Window Town Sedan, Slant Window Deluxe Fordor (Blindback), Convertible Sedan, Deluxe Pickup and Wide Bed Pickup (box). Almost every Ford Mod. A car body will be found in this gathering! From the same FMA gathering. Riding the roads and the airwaves. The Ford Model A was the subject of the 1928 song, “Henry’s Made a Lady Out of Lizzie,” which sang the praises of Ford’s new addition to the road. The first Model A Ford engine, stamped “A1” by Henry Ford himself on October 20, 1927, was put in a Tudor Sedan that Ford personally drove and tested before giving final approval to begin production of the car. At Henry Ford’s request, the engine was eventually placed in a 1928 Phaeton that was reserved in Dearborn for the use of his friend and fellow innovator, Thomas Edison. 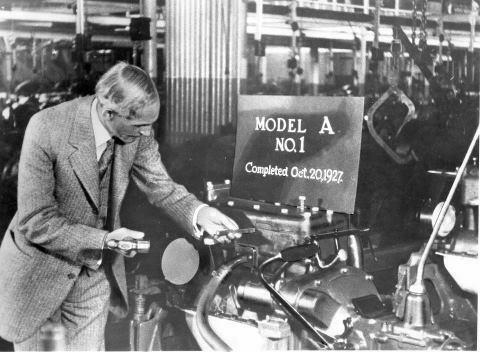 Henry Ford punches the engine number on the first Ford Model A off the assembly line. The 20 Millionth Ford was a 1931 Ford Model A 160-B Slant Windshield Town Sedan. Accompanied off the assembly line by Henry and Edsel Ford, the black car was lettered on the sides and, so it could be seen from the air, the roof, with “The Twenty Millionth Ford.” The Sedan would be taken on a tour of the U.S., stopping at nearly every Ford territory and dealer along the way. Rumored to be lost in a fire sometime after the publicity tour, the car was discovered in Michigan in 1999. 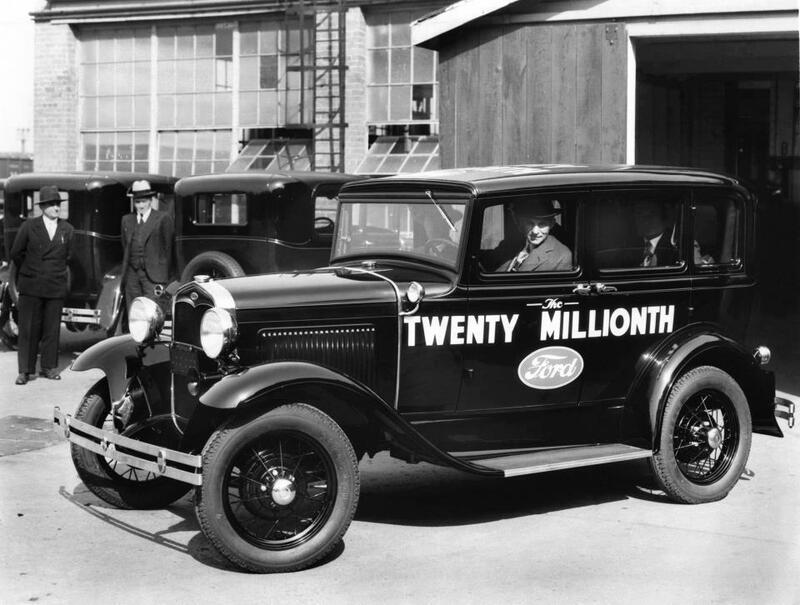 After Ford determined it was indeed “The Twenty Millionth Ford,” the company agreed to lease the car from its current owner. Ford then devoted their resources to a complete restoration of the car in preparation for their 2003 Centennial celebration. As part of the lease agreement, the Town Sedan will be displayed at Ford World Headquarters for the following 10 years. The Twenty Millionth Ford Model A was an 8 window 1931 Ford Model A 160-B Slant Windshield Town Sedan! 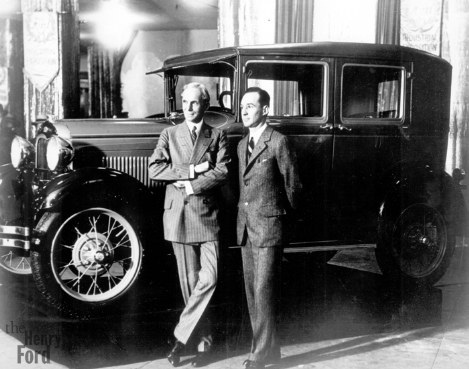 Henry Ford and his son Edsel in front of a Mod. A Fordor. 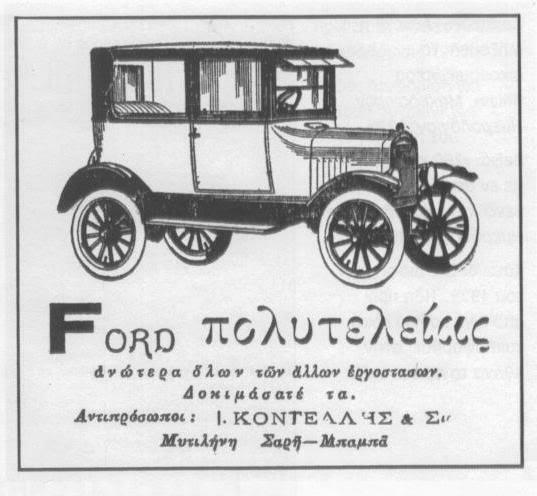 A period advertisement from the first Ford distributor in Greece, J. Kontellis & Co. Finally, few pictures of our Father’s (Emmanuel V. Riginos) 1929 Ford Mod. A Tudor which he brought to Greece upon his return from an extended 15 year period of immigration to the USA. 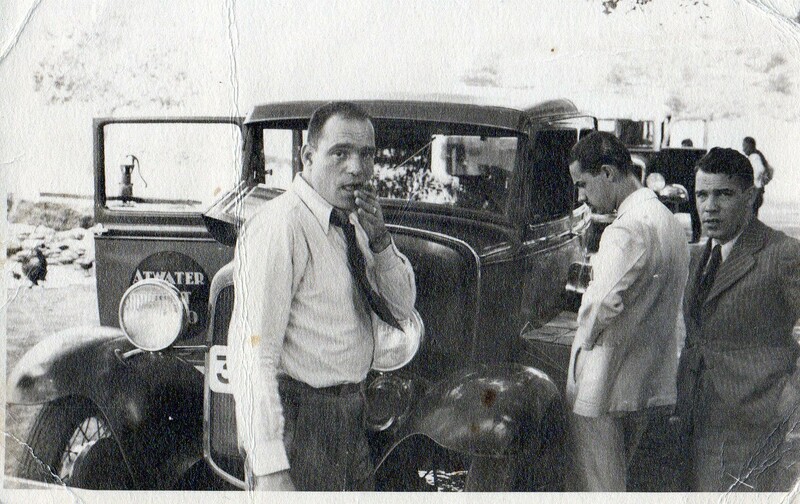 Upon his return to his homeland, he also brought (importing & distributing) the Atwater Kent radios to Greece in the late 20’s – early 30’s. He used a 1930 Ford Model A Tudor as his car and on the door panels the round “Atwater Kent Radios” logo was affixed. 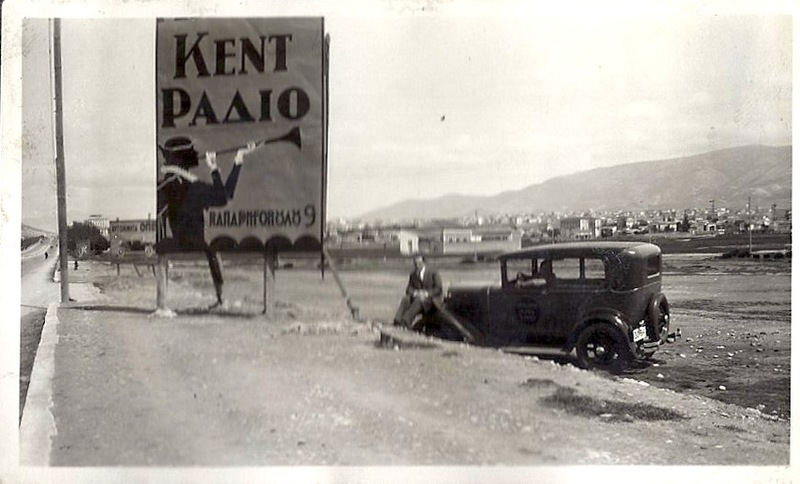 Here Emmanuel and his brother Alekos Riginos admire a newly erected street side advertisement of the ‘Kent Radio’. 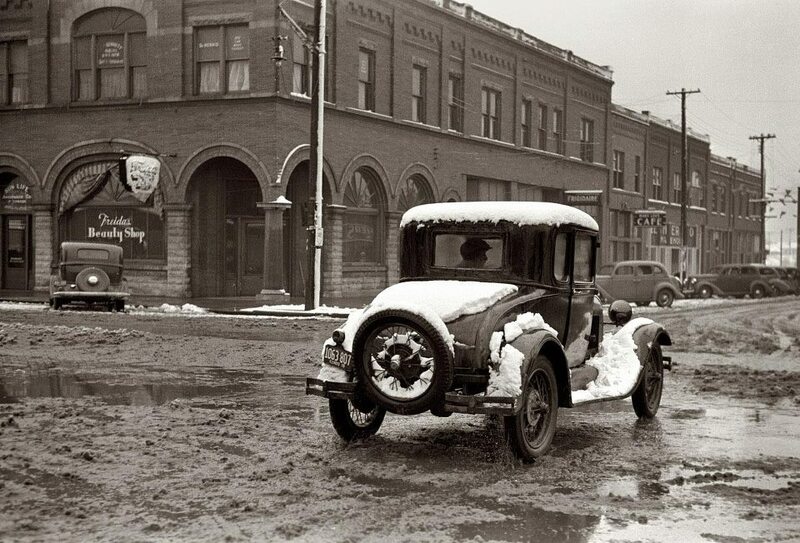 The Ford Model A has broken down! The agony of the moment is captured on the faces of Emmanuel and his other brother George Riginos’s faces. Manolis Riginos Ford Model A Tudor, bearing Greek License Plate No. 30914.
απιστευτο φωτογραφικο υλικο και αρθρο ! δεν ηξερα οτι ο Κοντελλης ήταν απο τόσο παλιά!! wonder how the names for the different models came up? Fordors meaning 4 doors, tudor meaning 2 dors or? Hello Kirsten from Denmark. Exactly as you say, the main Ford Model A names originate from a marketinguesque parlance where a two door sedan is renamed as “Tudor” and a four door as “Fordor”. Nice eh? FDR is sitting in a 1929 Model A Ford 68A Convertible Cabriolet, not a Roadster as stated in the caption. Unlike Roadsters, Cabriolets had non-folding windshield frames, smooth-sided cowls, roll-up side windows and external folding landau irons. Thanks Robert for your interest and comment 🙂 I have edited the caption accordingly.